Hold on to your shorts, and let’s get to know The Conman’s tricks. 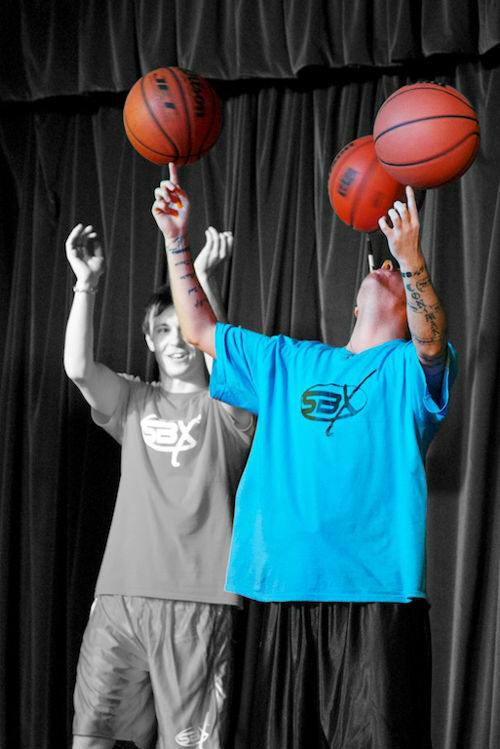 Basketball tricks that is. SB (StarBeat): Quick primer: For those who may not know – what is Streetball? CB (Conman Basketball): Streetball started on the street basketball courts of America. The style of the game is much more entertaining, less structure than the regular game of basketball. There’s not a ref there so you can get away with some extra dribbles or things you wouldn’t get away with in a regular game. It makes the game more exciting. That’s something that I got hooked on – watching these crazy tricks, dunks, the crowd reaction and I just thought it was mind-blowing. SB: History: Can you give us some details about you and how you got your nickname? 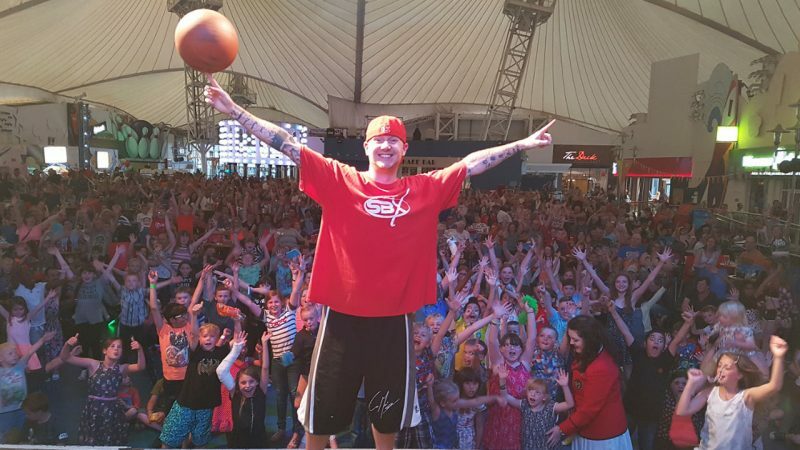 CB: I’ve been a professional Streetball player for 11 years, I’ve been UK and European Streetball champion, I’m currently the face of UK basketball with a great scheme called Sport and Champions where I get to go around to schools and youth clubs and get the kids to pick up a basketball. How I picked up my nickname of Conman – my second name is Connors and my style of basketball is to embarrass and trick people with the basketball, and people would say to them ‘You got conned!” and The Conman developed from there. SB: World Record: We hear you have a few Guinness World Records? What is your favourite? CB: I currently hold 16 basketball World Records. 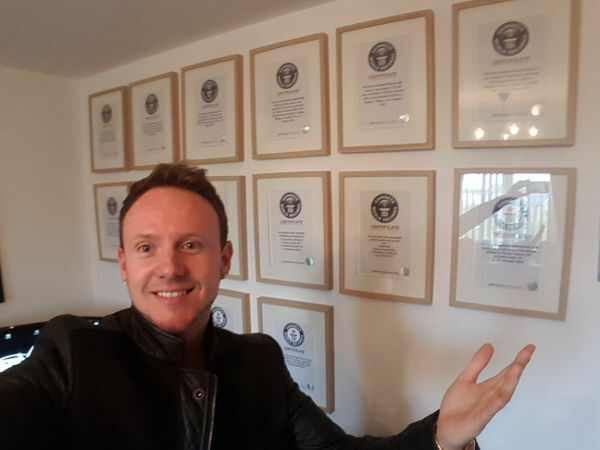 If I had to choose my favourite Guinness World Record – that would be tough. Let’s do Top 3. First would be spinning the basketball on my elbow for the longest time, second would be the most amount of arm rolls where I did 120 in 60 seconds. 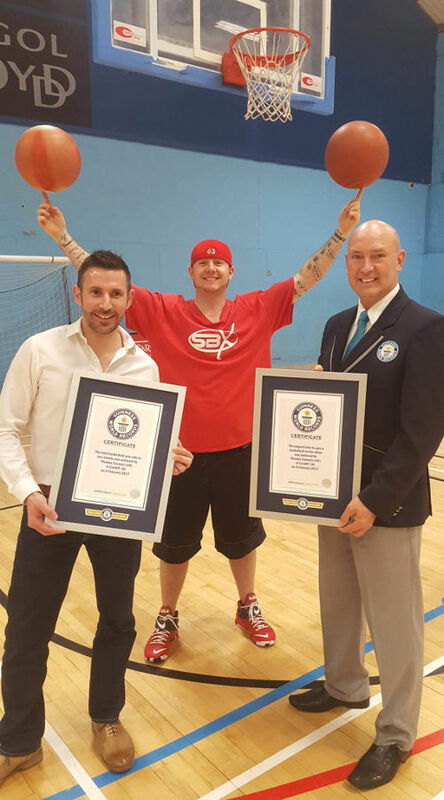 My favourite Guinness World Record would be the most amount of backward shots from half court without looking while shooting the basketball – which I did 6 in 60 seconds – that’s definitely my favourite Guinness World Record! SB: Quick Start: When did you post your first Streetball video? 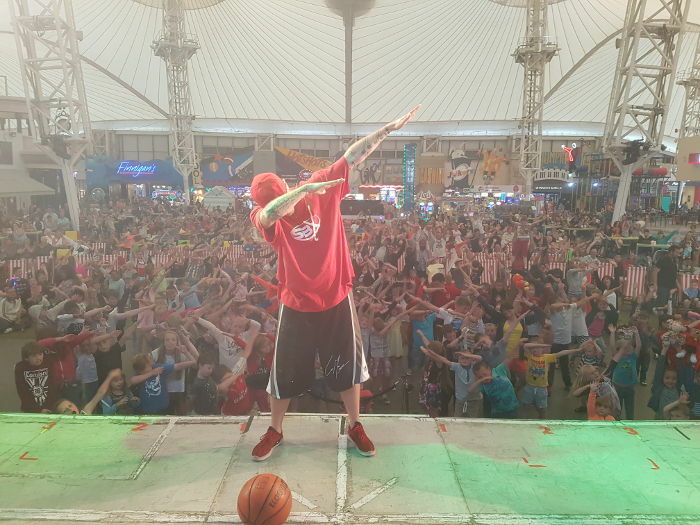 CB: So how I got started was I got my first video ready for online, the editor came down with it and we had been filming all up and down the UK and I was trying to bust out all these crazy Streetball moves for my first video. I was super nervous about it and all I remember is the first 15 seconds – I was like this feels good, the music was bumping and I was blown away by the whole thing, the video was epic. It was super nerve wracking and we put out the video the next day and within 2 days it went super viral like close to 2 million views. I remember doing 40-50 interviews in a few days and I remember at the end of the week I just sat there like ‘What just happened?’. I was blown away. And I remember reflecting at the end of the week that all my dreams were coming true. I knew I had a lot of Streetball moves that had never been seen before and I felt like I could do something really special but getting that confirmation from everybody I was super touched and super excited. What was almost more nerve wracking was that I actually had a second video ready, and I was going to release both videos at the same time but the first video did so well and with all the interviews and everything it was a crazy week. I still knew I had this second video that was a Freestyle video different from the Streetball but it also had never seen before moves in it. I put that video out about 6 days after the first one and again it got to 2 or 3 million views within a few days. The combination of the two videos together pretty much started my whole career for me. SB: The Most Viral: What was the video that really took it viral? CB: So I had a basketball stage show about 6 hours from home, and we left really early in the morning. There were 2,000 people ready to watch me do some moves on stage. Throughout my time making videos I would pick out the best moves and I made a compilation over a few months of some of the best Streetball moves I’ve ever done. So at the time I had 7,000 likes on my Facebook page and I post the video to my wall. About an hour into the trip we check and the video already has 10,000 views. Still didn’t think that much of it, half way though the trip it’s 50,000 views…then 250,000 views. By the time we drive the 6 hours the video has 900,000 something views and I’m about to do this show. I’m getting ready to go on stage, getting changed and I keep asking ‘What’s the video on now?’ – it was so close. I’m like – I need to know that I’ve hit 1 Million before I go on – and they are counting down like 10, 9 … 995,000 views…3,2,1 and as I step out all I hear in the background is ‘1 Million!’. Right when I got off stage – it was up to 2.3 million and it just kept climbing. Thank you everyone for watching – made it the best day ever. SB: Epic: What was your most epic video? CB: I’m going to have to say the video where I take over a shopping centre at night. It was the toughest sell ever to get in to the centre but we managed to pull it off. The deal was we only had 3 hours for the whole thing including set up and packing to leave. I remember being under so much pressure from the organizers, and when we showed up we found out we had to build the hoop from a flat pack box! So we ended up with about an hour and forty-five minutes for all the shots. I was quite lucky in a lot of the shots that I hit it the first time. I think the pressure was an added bonus because I knew I had to hit the shots quickly. SB: The Challenge: What was your most challenging video shoot? CB: So I have two of the best street dancers in Europe, the UK + European BMX champion, I have 17 time football Guinness world record holder doing football tricks, I also have a breakdancer there and myself. We had about 4 hours to do the whole thing. So I remember I’m trying to organize everybody, I’m trying to do the tricks, I’m trying to do the script, I’m trying to direct, I mean everything. And each scene was hard to set up because it was leading on the next shot. Every single step from A to Z had to be planned out. I’m like ‘The Conman can’t do ten things at once!”. It was so stressful because if you missed just one bit it won’t work because it was all scripted out. One of the most epic shots of the day was the breakdancer spinning on his head on top of a grand piano – I had it all planned out and it turns out amazing. Only the organizers come to us at the end and say “Didn’t you see in the email you weren’t allowed to use the piano?”. So come to the edit and I had to choose to put it in or not but it was too good so we put it in and sent it to the organizers with a huge note in bold saying sooo sorry! The video turned out amazing.